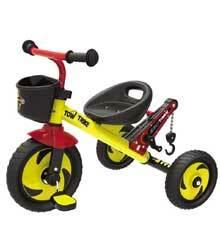 Eurotrikes cool Tow Trike with real working towing mast is great playtime fun. It has up and down controls for the tow line plus lock and unlock controls for the tow hook. Fantastic cross play opportunities for kids to use imagination and gross motor skills on the crane as well as funtime fitness outdoors and riding.